How can I move a submission from one form to another? 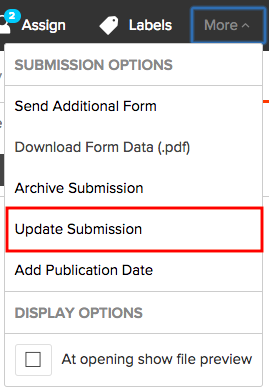 Move submissions by using the "Update Submission" option. 1. In the Submissions tab, click the name of the submission you'd like to change. 2. In the Submission details page, click the More menu at the top of the screen. Choose Update Submission. 3. In the Update Submission dialog, click on the Form dropdown menu and choose the form to which you'd like to move the submission. Note: If the submission uses the review form system and has already had a review completed for it, you won't be able to move it, because review forms are tied to particular forms. As a workaround, administrators can delete the completed reviews for that submission (in the Submission details page, click the Reviews sidebar on the right-hand side of the screen > choose the Trash icon next to each completed review). Once the submission has no completed reviews, you'll be able to change the submission form by following the steps above. Note: If a submission is open for editing it should not be moved to another form. Also, if a submission has already been moved from one form to another, it should not be opened for editing once it has been moved.